Mexico's leftist presidential candidate Andres Manuel Lopez Obrador called his supporters onto the streets Saturday to protest his rival's narrow victory in a vote he said was more fraudulent than those held during 71 years of one-party rule. The nationwide protests, including a rally in Mexico City's famed Zocalo plaza, could mark a turning point in what has so far been a peaceful campaign by the fiery candidate to reverse the apparent triumph of conservative Felipe Calderon. In a meeting with foreign correspondents Saturday, Lopez Obrador said there were more irregularities in last Sunday's balloting than in elections under the Institutional Revolutionary Party, or PRI, which ruled Mexico until it was ousted by President Vicente Fox in 2000. Election officials say Calderon of Fox's National Action Party, beat Lopez Obrador by less than 244,000 votes out of a total 41 million ballots, or a margin of about 0.6 percent. 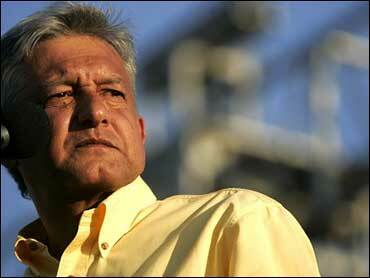 "The National Action Party learned from the fraudulent practices of the PRI and it exceeded them," Lopez Obrador said. Calderon, who insists the vote was clean, has already declared himself the winner and taken congratulatory phone calls from U.S. President George W. Bush, Canadian Prime Minister Stephen Harper and Spanish Prime Minister Jose Luis Rodriguez Zapatero. A European Union observer mission has said it found no irregularities in the final count. Lopez Obrador, the silvery-haired former Mexico City mayor, has asked protesters to be peaceful and law-abiding, but also said the government would be responsible for any flare-up of anger after officials rejected his demand for a manual recount of Sunday's extremely close vote. Alberto Anaya, a leader of Lopez Obrador's coalition, said that "those who oppose clearing up these election results are the ones who could start to generate unrest and discontent." The U.S. Embassy in Mexico City urged U.S. citizens "to avoid downtown Mexico City and surrounding areas" during Saturday's protest, noting that foreigners are prohibited by law from political activity here and that "even demonstrations intended to be peaceful can turn confrontational and escalate into violence." The stakes are high. Lopez Obrador remains convinced he won the elections. He has millions of extremely devoted followers who religiously follow his message of helping the poor and downtrodden, and he views street protests as an effective means of pressuring the government and the courts. "The message that he's sending is, 'They wouldn't let me win,' that the umpire was unfair, that the government was unfair," political analyst Oscar Aguilar said. While violent protests appear unlikely, Aguilar predicted that Lopez Obrador would never recognize the narrow electoral victory of conservative Calderon. "He will never concede defeat," Aguilar said. "Once the election results are certified, he will open a permanent campaign of criticizing the government." Lopez Obrador says he will challenge the result in electoral tribunals and also in the Supreme Court. He claims hundreds of thousands of votes for him remain uncounted, miscounted or voided, and that a manual recount would confirm that. Electoral authorities say the law allows such a recount only where credible evidence of irregularities exist for a specific polling place. The leftist's supporters say that clause would cover at least 50,000 of the approximately 130,000 polling places. Lopez Obrador's Campaign coordinator Ricardo Monreal pledged that "we will do everything peacefully and in accordance with the law." But Lopez Obrador has in the past headed protests that turned violent or disruptive. In 1996, he led farmers and fishermen in sometimes-violent takeovers of state-owned oil wells to demand compensation for damages from an oil spill. Nor does he tire easily of protesting. In 1995, when he raised accusations of fraud in Tabasco state elections, he led months of road caravans and marches and set up a protest camp in Mexico City's main square. Last year, as Mexico City mayor, he led huge street protests that forced Fox to fire his attorney general and drop a legal case that would have kept Lopez Obrador out of the presidential race for ignoring a judge's order. But these days, Lopez Obrador must walk a tightrope. If he appears too radical, he risks hurting his party and its chances in the next presidential elections in 2012. If he appears too moderate, he risks disappointing his core supporters. "His political stock would increase greatly for 2012" if he finds a way to concede defeat gracefully, Aguilar said.